For an article template add the text [[SCREENSTEPS_ARTICLE]] to the document. This text should have no styling applied to it. You can place the [[ARTICLE_TITLE]] variable in the Header section of the template. The name of the Clarify document will be inserted in place of the variable. 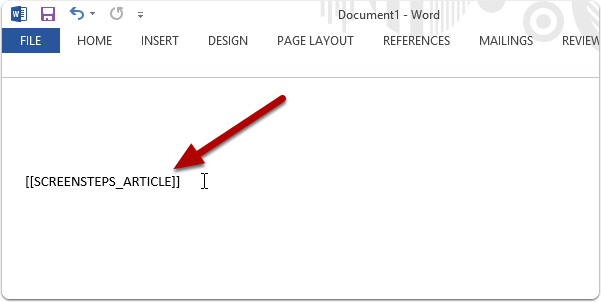 In the footer you can use the [[ARTICLE_TITLE]] and [[FOOTER_TEXT]]. The [[FOOTER_TEXT]] variable is the footer text that you enter when configuring a sharing account in the Share preference pane. If your variables are not being replaced when you export then it may be that Word has split the variable text up into multiple blocks of text inside of the template file. Try retyping the variable name again and then saving the document.